(NaturalNews) It isn't difficult to find research demonstrating the health benefits of curcumin. Studies have shown that this yellow-colored curcuminoid, which is the main active compound in turmeric, can reduce the risk of heart disease, high blood pressure and cognitive decline. Additionally, curcumin increases the antioxidant capacity of the body, lending it significant anti-aging and cancer-fighting properties. However, a new, double-blind, randomized-controlled study published in the European Journal of Applied Physiology in March 2015 has given us more reasons to love curcumin: It can help reduce pain associated with delayed onset muscle soreness (DOMS) and aid muscle recovery in physically active people. Seeking to determine whether curcumin had an impact on "single-leg jump performance and DOMS following unaccustomed heavy eccentric exercise," the study researchers gave 17 male volunteers 2.5 grams of oral curcumin (or a placebo) twice daily "2 [days] before to 3 [days] after eccentric single-leg press exercise, separated by [a] 14 [day] washout." During this trial period, the researchers monitored post-exercise limb pain, muscle swelling and other indicators of muscle damage and inflammation. Measurements were made at baseline, immediately after exercises, one day after exercises and two days after exercises. The results were positive: Aside from inducing moderate to large reductions in pain caused by single-leg squats, gluteal stretches and squat jumps, the curcumin supplements also caused small reductions in creatine kinase activity (increased amounts of creatine kinase in the bloodstream is associated with muscle damage). The researchers even found that curcumin improved the volunteers' single-leg jump performances due to its anti-inflammatory benefits. "Oral curcumin likely reduces pain associated with DOMS with some evidence for enhanced recovery of muscle performance," concluded the researchers. However, they also admitted that "[f]urther study is required on mechanisms and translational effects on sport or vocational performance." 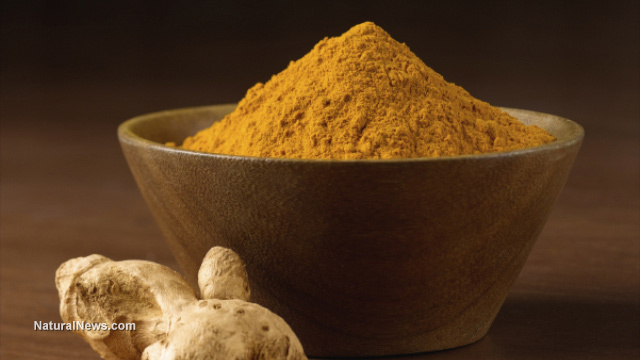 If you're interested in taking curcumin as a supplement, you'll soon find that you're spoiled for choice. Word has spread far and wide about this amazing medicinal chemical, and most health food stores are now packed with different brands of it. Though curcumin is available as a standalone supplement, many people prefer to take it in whole food form, i.e., turmeric. Organic, non-irradiated turmeric powder, consumed either "as is" or in capsule form, is packed with naturally occurring curcumin that can produce many health benefits over time. Please note that turmeric and curcumin supplements are not suitable for pregnant women or individuals with bile duct dysfunction or gallstones.